These banana chocolate chip muffins are full of fibre, but they taste really good, so good that they don’t taste like they are healthy or full of fibre. You are going to be tempted to eat more than one of these banana muffins, say three. Please don’t. Eating three of my recipe for banana muffins all at once is the equivalent of eating all of your required grams of fibre, if you are an adult female, in one sitting. Have one a day, with something to drink and I’m happy, your colon is happy, you’re happy, everybody is happy. Preheat the oven to 400F°(200C°). Line a muffin tin with large or jumbo paper cup liners. Set aside. In a large bowl using a fork or a wire whisk mix together all the dry ingredients: whole wheat flour, flaxseed, wheat bran, oat bran, chocolate or chocolate chips, wheat germ, baking soda, baking powder and cinnamon. Scoop into muffin cups and bake for 20 to 25 minutes or until done. Tip: this is going to look like you could make 18 muffins, but these whole grain muffins don’t raise that much and to get the full health hit you need to make only 12, no more…. 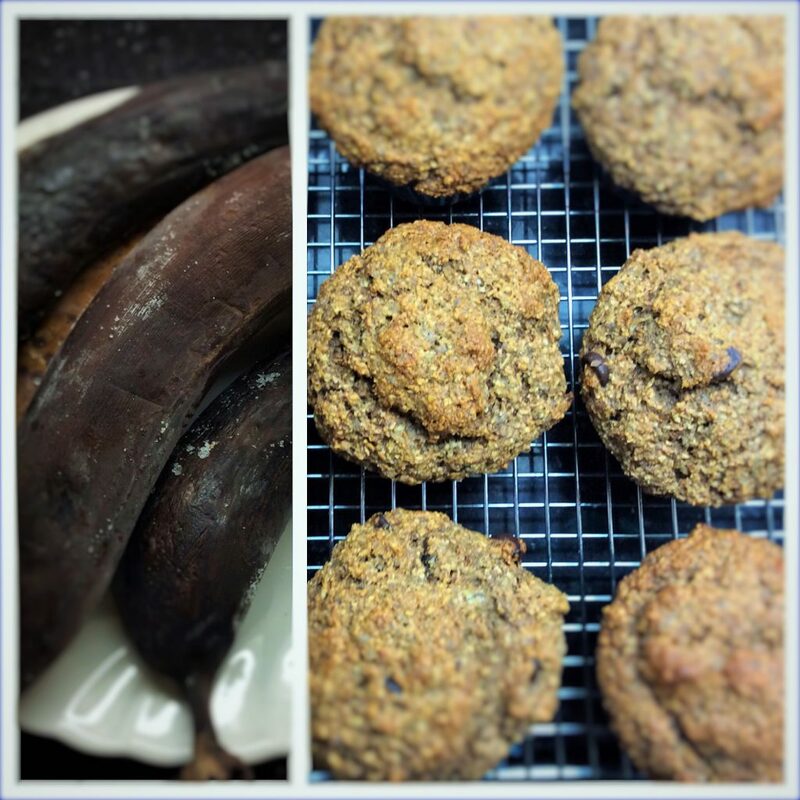 Have any overripe bananas kicking around your counter? Freeze them whole. Two things happen in the freezing: one you didn’t waste food and two freezing breaks down the cell walls inside the banana so when they thaw they are the perfect consistency for any baked good that calls for mashed ripe bananas. what if i dont have wheat bran and oat bran on hand? will the recipe still turn out? Oat and whet bran not only offer fibre but they help absorb liquid in the recipe, without these two ingredients the muffins would be very wet and not have much structure. The fibre count is high,so I’d give 1/4 of the muffin to a 15 month old.